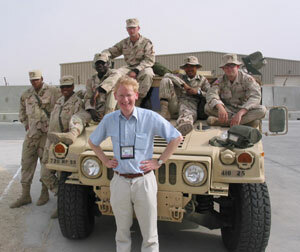 Tim Ripley is a prolific author of books on military and defence subjects. Recent titles have covered modern conflicts, historical subjects and military technology. Military technology was profiled in Bombs Gone! Aircraft Ordnance in Action (1994), Modern Strike Aircraft (Salamander 1992), Modern US Army weapons and Equipment (1992), Jane’s Modern Military Helicopters (Harper Collins 1997). The grim details of frontline combat were the subject of Bayonet Battle (Sidgwick & Jackson, 1999), The Whites of their Eyes (Sidgwick & Jackson 1998) and Mercenaries: Soldiers of Fortune (1997). World War Two German military history has become a specialty. His Steel Storm: Waffen-SS Panzer Battles on the Eastern Front 1943-45, (Sutton, 2000) and Steel Rain: Waffen-SS Panzer Battles on the Western Front 1944-45 (Brown 2001) received critical acclaim. Wehrmacht (Fitzroy) was published in spring 2002, along with Elite Units of the Third Reich. Patton Unleashed (Brown Reference Group), which chronicles the relentless advance across France by the US Third Army led by the famous General George Patton was published in 2003. Air War Iraq (Pen & Sword), which profiles the role of air power in the US-led invasion of Iraq was published in 2003.